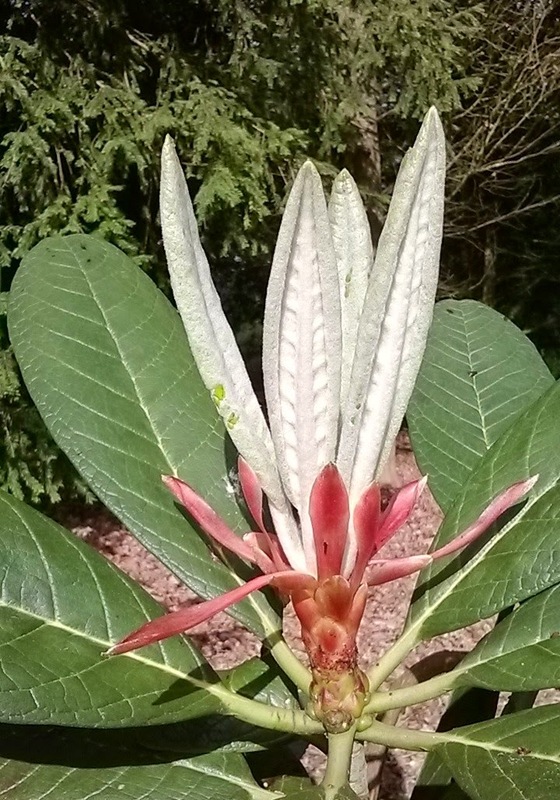 Unknown hybrid Rhododendron: not too bad a pic, but slightly 'flat'. Having been shamed into exchanging my old 'brick' for a smartphone recently, and (remarkably) had it in my pocket this morning when I was in Ray Wood. Having no other camera with me I thought it would be worth trying the phone's camera to capture a record of the tremendous display currently to be seen there. These are a few of the results, with annotations. Clearly the phone camera is not totally useless, in a pinch, but I hope I don't have to use it too often. A very flattened view of quite a pleasing combination. Many of these pics remind me of an early colour copy of National Geographic. 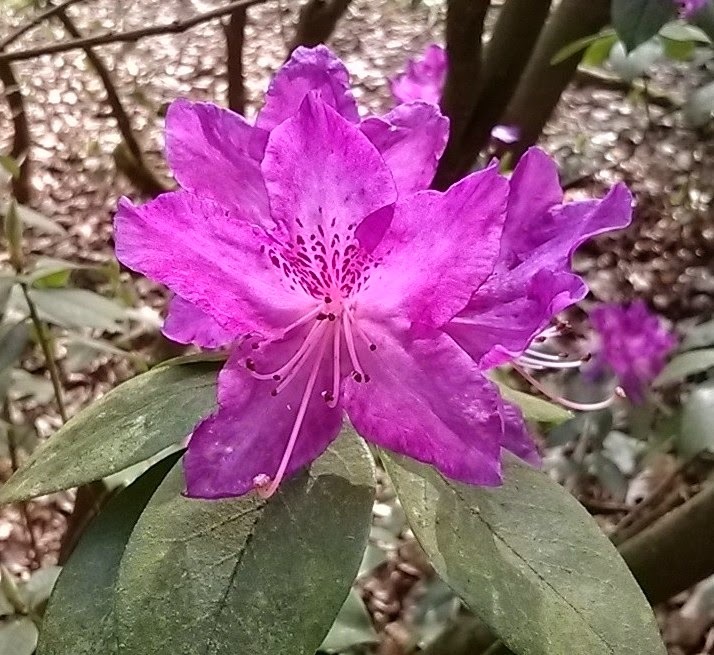 Rhododendron augustinii 'Electra': the camera has failed to catch the beautiful blue of this amazing clone, and most detail of the flowers is gone too. 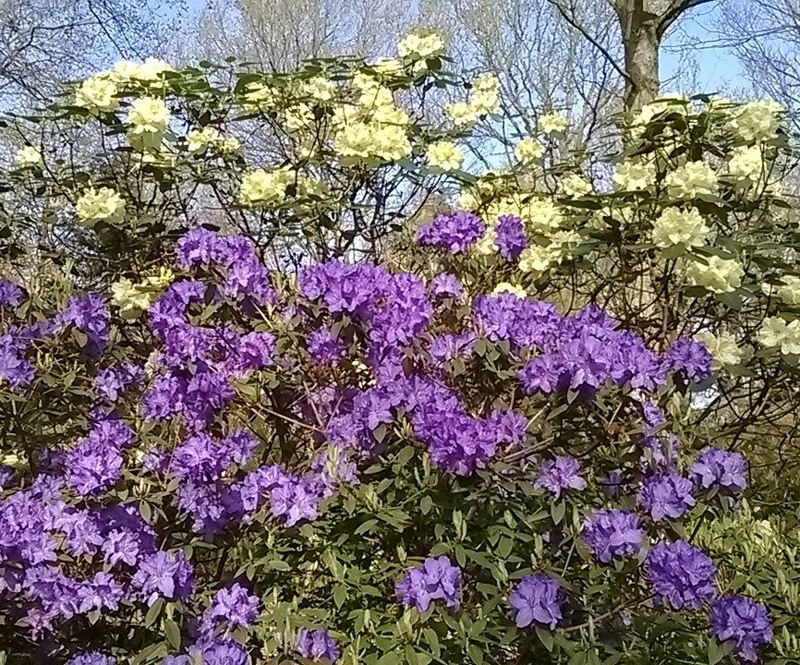 The strangely dulled effect is clearly seen here, although the azalea doesn't fare too badly. 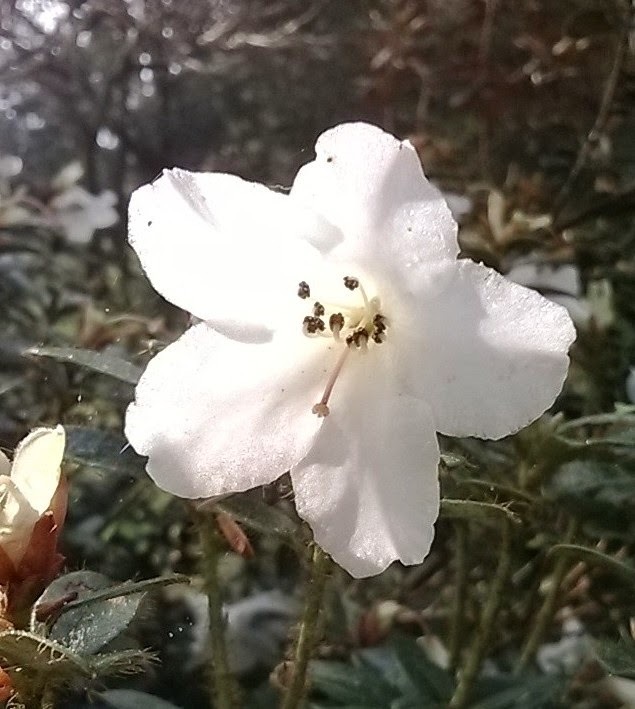 It's labelled 'Tsuta-Momiji', but doesn't fit the description of that in the Rhododendron Register. Well-focused, and the flower colour is OK, but again 'flat'. Rhododendron amesiae, considered to be Critically Endangered in the wild by the IUCN. Expanding foliage of R. kesangiae: an acceptable image. 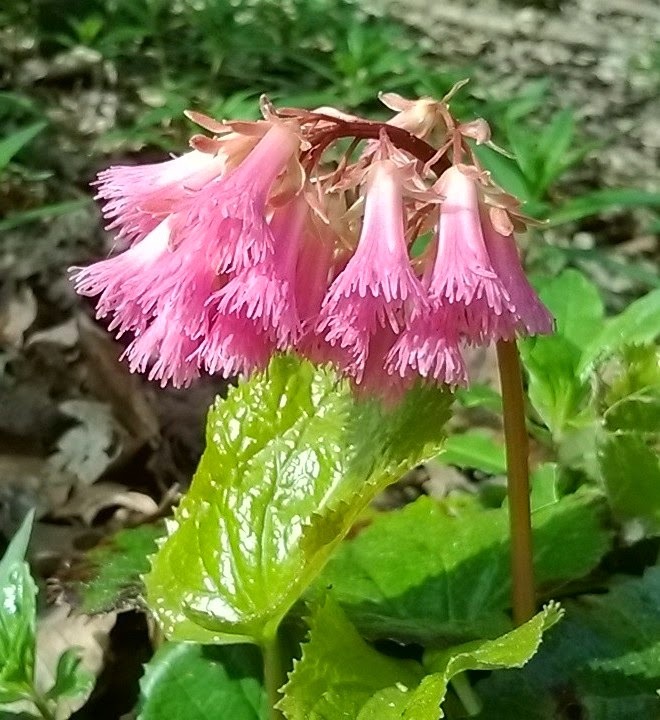 And a good shot of Shortia soldanelloides, an astonishing long-term survivor. Rhododendron 'Hille', a remarkably well-spotted hybrid. With my colleague Jonathan Watkinson, who looks after our garden in Ray Wood at Castle Howard, I visited the Himalayan Garden and Sculpture Park near Ripon today. It was grey and gloomy, but we were warmly welcomed by Jenny Wells and Hannah Wilson, who are the Rhododendron specialists there. 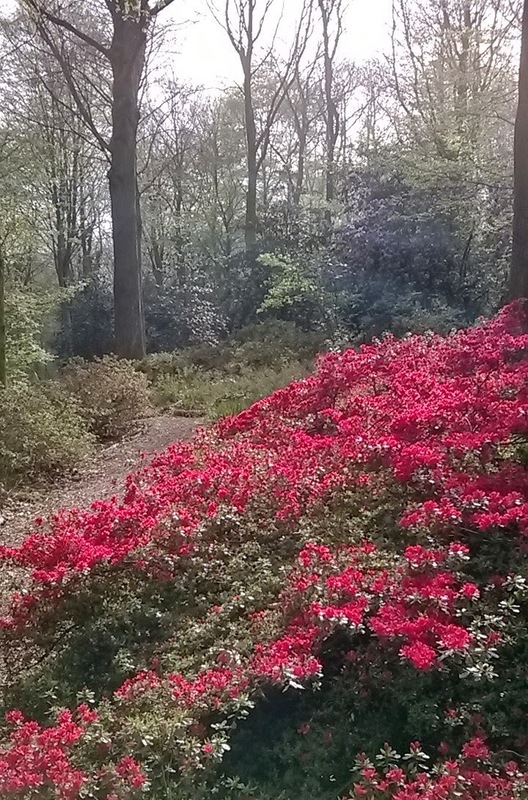 Despite having come from very different backgrounds, and without prior horticultural training, they have both developed an intense passion for and detailed knowledge of the genus Rhododendron - and have an amazing place to develop it in. 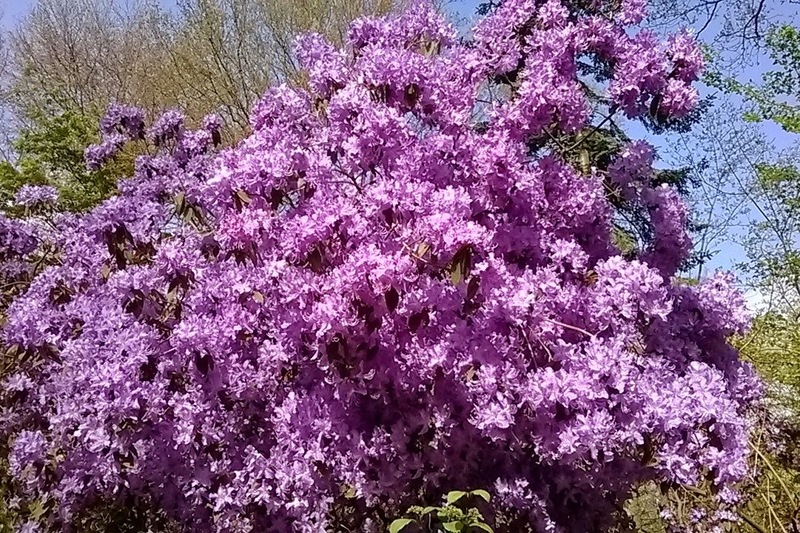 The Himalayan Garden was started by Peter Roberts when he purchased the property, known as The Hutts, in 1996, and with encouragement from others, started planting rhododendrons en masse in this valley-side site in the Pennines. 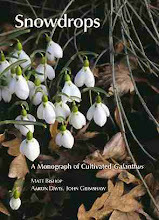 Evidently starting as a 'one of everything' collection, it has evolved so that there are now large masses of many hybrids and increasing numbers of species, in a garden where other plants are also becoming conspicuous. 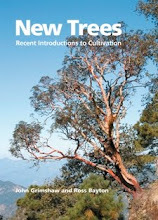 It may not to be everyone's taste, but it is without doubt a very important collection, and increasing in interest each year as new material is raised in the extensive nursery and planted out. The Yorkshire Arboretum is collaborating with 'the girls' to get some of our rarer material propagated and established at The Hutts, using their specialist propagation skills - young plants will also come back to us when they're ready, and my car is already loaded with some large plants of Rhododendron calophytum that will find a good home in Ray Wood. Thank you, Jenny and Hannah! A propagation case containing grafted rhododendrons from Ray Wood, with our precious R. lanatoides in the centre. Mixed hybrids from an early planting. In the lower part of the garden the lake has a floating magnolia flower sculpture, reflecting the collection of magnolias in the garden. Looking really handsome by the lake was this unusually attractive butterbur, apparently Petasites hybridus. The curious foliage of R. 'Cheiranthifolium', an old hybrid of R. ponticum. To mark the 450th anniversary of Shakespeare's birth today, here are a few botanical references from his work. Many more could be thought of, but these are all in flower at the arboretum today, and on what has been a glorious English spring day they seem most appropriate for this commemoration. Native Pulsatilla vulgaris in Gloucestershire - as usual only a few plants were flowering at this site. Narcissus 'Thalia' at the Yorkshire Arboretum: we put in 3000 bulbs of this last autumn. With the vistas and paths mown into rapidly growing grass the arboretum looks crisp and kempt, the result of a lot of hard work by my staff and volunteers through the winter. Male cones of Abies fabri, Congrove Cottage, South Gloucestershire. An extraordinary sight in an open situation in England: Acacia pravissima in full flower at Congrove (though they have had only one night of frost all winter). A sumptuous Anemone coronaria 'Bordeaux' in the garden today. With fine weather - though windy - this weekend, it has been delightful to be in the garden and to be able to get things done, preparing the garden for the rush that is to come over the next few weeks. Without a greenhouse growing things in pots, especially tender plants, is a challenge. The various house windowsills had a clear-out today to give potted plants a good watering, but it is the hardening off that presents the greatest challenge. It's not just a temperature issue: plants grown without exposure to direct sunshine or moving air are very unprepared for exposure, and I did a lot of juggling things in and out of doorways today. Last year's fern fronds have been cut off, revealing swelling croziers. this is a Polystichum setiferum cultivar. A temporarily upward-facing Erythronium showing the beautiful markings in its throat. Not subject to migration outdoors, at least yet, is this Cymbidium 'Doris Dawson 'Scotch Mist' on my study windowsill, flowering again after a year in my care. The very last snowdrop of the season, a secondary flower of 'Little Drip'. A poll option is given in the righthand sidebar. A visit to friends in the Lake District gave me the opportunity to return to Holehird Gardens this afternoon. The 17 acres of neatly kept gardens are run entirely by volunteers who are members of the Lakeland Horticultural Society, and are a testimony to their competence and good will. Unfortunately the Lake District lived up to its reputation for heavy rainfall for the whole weekend, and the gardens were thoroughly drenched: it was a brief visit and these are a few iPad snaps to give an idea of the range of interesting plants currently in flower there. There is no cafe at Holehird, but I can thoroughly recommend Francine's, in nearby Windermere, for an excellent lunch. The only dry spot: the alpine house, with nicely constructed tufa walls full of choice plants. Saxifraga x biasolettoi 'Atropurpurea' (though the RHS Plant Finder suggests this name may not be correct). 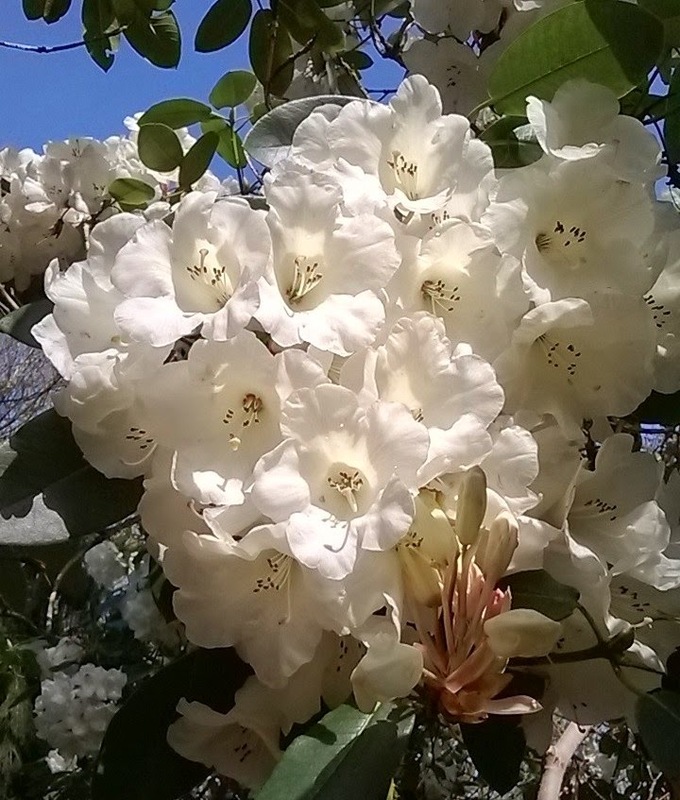 Rhododendron 'Pemakofairy', ground-hugging dwarf with comparatively large flowers, rather the worse for rain. The daffodils were sadly much bashed-about by wind and heavy rain. I thought the planting round this runnel (taking run-off through the walled garden) was very well done: the combination of Corydalis and Dicentra is charming. The picture really doesn't do it justice.